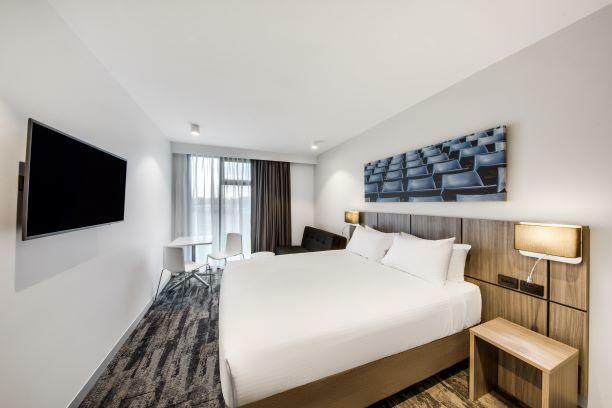 يشكل Travelodge Blacktown Hotel بموقعه الممتاز في سيدني نقطة انطلاق جيدة لاستكشاف هذه المدينة النابضة بالحياة. يقع مركز المدينة على بعد 34 km فقط. ويمكن الوصول إلى المطار خلال 41 دقيقة. كما يمكن الوصول بسهولة إلى Blacktown Hospital, ‪Nurragingy Reserve‬, Saints Medical Centre. كما يقدم Travelodge Blacktown Hotel الكثير من الخدمات لإغناء رحلتك في سيدني. يمكن الاستمتاع بمجموعة من الخدمات على أعلى المستويات في الفندق كمثل مكتب الاستقبال على مدار الساعة, مرافق مخصصة لذوي الاحتياجات الخاصة, تسجيل وصول/خروج سريع, تخزين الأمتعة, صف السيارات. استمتع بوسائل الراحة الراقية في الغرف أثناء إقامتك هنا. بعض الغرف تتضمن تلفزيون بشاشة مسطحة, غرف لغير المدخنين, مكيف هواء, خدمة الإيقاظ, مكتب لمساعدتك على استعادة طاقتك بعد يوم طويل. يقدم الفندق مجموعة رائعة من الخدمات كمثل حديقة، لجعل إقامتك تجربة لا تنسى. إن Travelodge Blacktown Hotel هو خيار ذكي بالنسبة للمسافرين إلى سيدني، بما يوفره من إقامة هادئة ومرحة. يجب تقديم نسخة مطبوعة من بطاقة الائتمان أو سند نقدي بقيمة 100 دولار أسترالي عند تسجيل الوصول. Decent hotel which has easy access to the M4 if you are looking to get out of Sydney and beat the traffic early in the morning. The club next door is pretty good for dinner with a good value buffet. Hotel itself might be a bit nicer when they update with the current renovations. This hotel often has good deals. It is out in the Western suburbs of Sydney so would only be suitable if you were needing to spend time out that way. Parking is easy, though not secure. The hotel was having some renovations last time we were there. I booked for 2 adults and one child with Agoda, but the room was only a Queen size bed. Said I need to pay for extra bed. staff informed 3x that aircon was not working... they checked 3x And said it’s gonna work, just give it sometime. We left and went back to hotel at 3am on New Years day. Room was stuffy warm, refrigerator was not cold enough. We were so tired to ask a staff. To check it, Nobody on the reception. Checked out at almost 11am and the staff was informed again before we left. We only needed somewhere to sleep for the night and this was a cheap and handy option near the highway. The hotel is a bit dated and worn out but clean. Across the road from maccas which is handy when you get in late at night like we did and don't have the energy to go out. The room was big and clean and the hotel was quiet, but its location took all the advantage of it. We have stayed here a few times for work. It is clean and comfortable and in a good location for easy access to the surrounding areas. After calling to complain about the loud noise the air con was projecting every 30 seconds, I was offered a fan heater that I had to go and pick up myself from reception. Too pricey for the old style room. We found Blacktown Travelodge from the moment we arrived to be extremely friendly, and accommodating. Nothing was too much trouble. Having the workman's club right next door was fantastic and the food brilliant. We found the rooms to be everything we needed and the bathroom was good. I have a very tall husband who has trouble in most showers but here it was great. All in all we would definitely recommend Blacktown Travelodge and will definitely be staying here again. Stayed here during NSW Mens Open st Stonecutters. Staff helpful with parking of motor scooter. Accidently left clothing in room ... recovered it from reception well after checkout. Hada good stay + nice breakfast. Two uncomfortable single beds pushed together is not what I'd call a king size bed. Fridge did not even have water. Pipes in wall made loud noises whenever water was flowing in other rooms and hallway noise was excessive too. Room at very discounted (half price) rate apparently, though I thought it struggled to be value even then. Staff were pleasant and club with buffet next door was convenient. Had to ask every day for things that had not been done by housekeeping, sheets not changed for 8 days, room not vacuumed for 6 days,noise problems in back area near workers smoking area 12.30 at night,waste disposal emptied at 3am at front of hotel after we were moved, noisy adjoining room fixed by night manager 1 night , and by us thumping door at 1.10 ,12.30, and 2.10 on other nights what can I say !!!! Ease of booking Travelodge staff, friendly, polite and respectful. As long as you don't need to be close to the CBD its ok but Sydney being Sydney its expensive for what it is. This is a good base if you are working in the West of Sydney. Has access to the Workers Club next door as well as a McDonalds in Car Park.